1. Amanita sp-CR13, Bosque del Niño [10°9’4” N/ 84°14’42” W], Prov. Alajuela, Costa Rica. intro The description is based on the single specimen of this mushroom that has been collected in Costa Rica. cap The cap is 95 mm wide, brown to sepiaceous brown over the center, paler progressively toward the margin, unchanging when cut or bruised, planoconvex, subviscid when wet, and dull when dry. The flesh of the cap is off-white, unchanging when cut or bruised. The margin of the cap is striate (about 30% of the cap's radius but appearing shorter because the outermost 3± mm of the rcap is vertically oriented and the innermost ends of the striations. Volval remnants are absent from the cap. 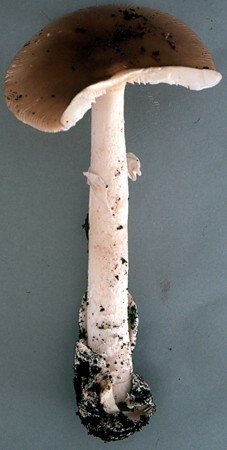 The cap's skin appears to be nearly 1 mm thick in cross-section. gills The gills are narrowly adnate, with a decurrent line descending (up to 40 mm) to the upper surface of the stem's ring; they are subdistant to close, cream in mass, pale cream in side view, unchanging when cut or bruised, with common forking and reverse forking common. The short gills are truncate to subtruncate, of diverse lengths, plentiful, and unevenly distributed. stem The stem is 152 × 14.5 mm, with an off-white to pale cream ground color, unchanging when cut or bruised, subcylindric or slightly narrowing upward, not flaring at the top of the stipe, and powdery to finely fibrillose both above and below the stem's ring, finely longitudinally striate in lower half. 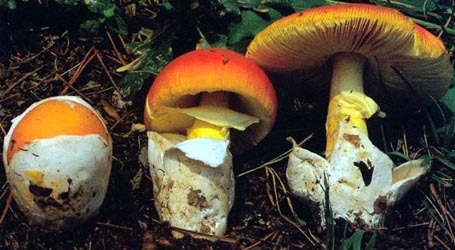 The stem's flesh is white above, pale orangish white below, unchanging when cut or bruised, and is stuffed fairly densely with white cottony material. The stem's ring is placed high on the stem and is membranous, thin, colored like the stem, strongly striate above, and smooth below. It eventually becomes torn and collapses on the stem. The sack-like volva is membranous, white on the outer surface, and pale orangish white to pale buff on on the inner surface. It may have uneven limbs (e.g., 30 mm high on one side of the stem and 70 mm high on the other side). It is 1.5 - 2.5 mm thick at the midpoint between its upper edge and its attachment to the stem, which is a short distance above the stem's base. No internal limb of the volva could be found. odor/taste This mushroom has only a faint odor and is tasteless. spores The spores have not yet been measured. pileus 95 mm wide, brown to sepiaceous brown over disc, paler progressively toward margin, unchanging when cut or bruised, planoconvex, subviscid when wet, dull when dry; context off-white, unchanging when cut or bruised, 8 mm thick over stipe, thinning evenly to within 3± mm of margin, then membranous to margin; margin striate (0.3R, but appearing shorter because outermost 3± mm of pileus vertically oriented and innermost ends of striae faint), nonappendiculate, strongly decurved; universal veil absent; pileipellis seeming nearly 1 mm thick in cross-section. lamellae narrowly adnate, with decurrent line descending (up to 40 mm) to upper surface of partial veil, subdistant to close, cream in mass, pale cream in side view, unchanging when cut or bruised, 8 - 8.5 mm broad, sometimes anastomosing, with forking and reverse forking common; lamellulae truncate to subtruncate, of diverse lengths, plentiful, unevenly distributed. stipe 152 × 14.5 mm, with off-white to pale cream ground color, unchanging when cut or bruised, subcylindric or slightly narrowing upward, not flaring at apex, pulverulent to finely fibrillose both above and below partial veil, finely longitudinally striate in lower half; context white above, pale orangish white below, unchanging when cut or bruised, stuffed moderately densely with white cottony material (with fibrils often longitudinally oriented), with central cylinder 5.5 mm wide; partial veil superior, membranous, thin, concolorous with stipe, strongly striate above, smooth below, becoming lacerate and collapsing on stipe; universal veil as saccate volva, membranous, white on exterior surface, pale orangish white to pale buff on interior surface, with uneven limbs (e.g., 30 mm high on one side of stipe and 70 mm on other), 1.5 - 2.5 mm thick at midpoint between tip of limb and attachment to stipe base, apparently without limbus internus, adnate to base of stipe for short distance. ecology Solitary, at 1900 m elev. In dark loam of mixed broad leaf forest including Quercus seemannii. material examined COSTA RICA: ALAJUELA—Ctn. Grecia - Grecia, Bosque del Niño [10°9’4” N/ 84°14’42” W], 15.vi.1995 J. L. Mata 609 (RET 155-6; USJ). photo RET - (1) Bosque del Niño, Prov. Alajuela, Costa Rica. select a collection to review/add spore measurements..#701586. J. L. Mata, #609, COSTA RICA, ALAJUELA, Ctn. Grecia, Grecia, Bosque del..#783507. J. L. Mata, #609, COSTA RICA, ALAJUELA, Ctn. Grecia, Grecia, Bosque del..